The idea of an approaching "blue wave" has been all over political news recently, referencing the prediction that Democrats are likely to win big in the November midterm elections. But Harry Enten, a CNN Politics senior writer and analyst, and CNN's Brian Stelter think the bigger story than this imminent blue wave is the question of how big that wave is actually going to be. "Right now, as an analyst, and if you pretty much ask anyone else who looks at these numbers honestly, the chances are that it's more likely to end up that Democrats control the House come after November than not," Enten told Stelter. "And so a blue wave is at least a possibility, if not a probability." Enten prefers the term "blue blizzard," which avoids the question of size. "Democrats will almost certainly pick up seats in this midterm election. It's just how many and how big," Enten said. "We've made the wave reference before. I don't necessarily know how helpful it is because there are both small waves and big waves." The tight race between Democratic candidate Danny O'Connor and Republican candidate Troy Balderson in Ohio's 12th district this week is the latest sign that Democrats are due for a successful Fall. It also demonstrated how the polls this year have been more accurate than usual, Enten said. "There was that final Monmouth Poll that had Danny O'Connor down by a point. And granted, not all the ballots have been counted there, but so far he's about down by a percentage point. That's pretty gosh darn good," he said. Enten does say that in the 2016 presidential race between Donald Trump and Hillary Clinton, the polling errors "were larger than normal," but said if you examine the polls historically, these were not the greatest errors of all time. He referenced Ronald Reagan, and how although the polls showed he was a favorite in 1980, "they didn't indicate anything close to him winning the national popular vote by say 10 percentage points and winning over 400 electoral votes." 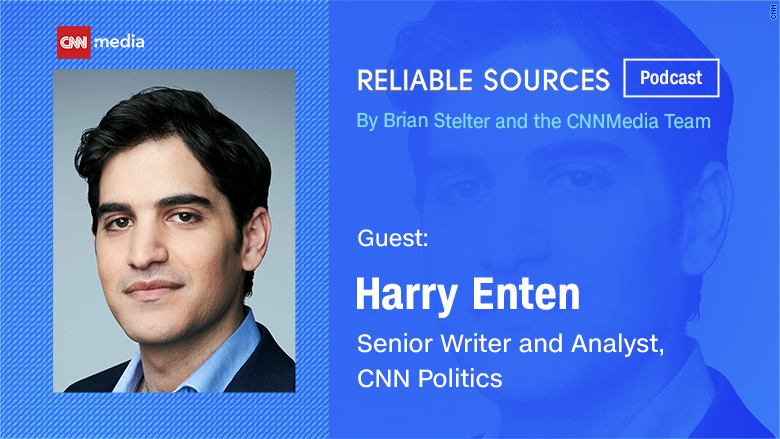 When asked by Stelter what pollsters and analysts have done since 2016 to try and communicate to the public that polls are complicated and can't predict the exact outcomes of an election, Enten said he has found that explaining margins of error to people can be very helpful. Explaining "how off polls have been historically" helps people gain a better understanding of how the polls could be off in a current situation, he said. "They're there to guide, they are not there to provide a pinpoint prediction." Election polls aren't the only misconception on Enten's mind. He also takes issue with how Trump's approval rating is reported on by the media. "This is one of the most bizarre things that has occurred in our press over the past two years," Enten said. "People are reporting Trump's approval rating among the GOP as if it's as important as his approval rating overall." He says the "core Republican electorate" only makes up about 25% of all voters, and this does not indicate how the midterm elections will turn out or reflect "the electorate at large." At the end of their discussion, Stelter read questions from his newsletter readers, one of which asked Enten to justify his "professional existence." Stelter clarified, posing the question of whether polling helps the public. "The polling can help tell a truth we can throw up against politicians' lies. It's another way of fact checking. It's another way of investigative journalism," Enten said. "There's going to be coverage of campaigns no matter what we do. And polling I think helps tell a more accurate story for journalists and therefore helps inform the citizenry better." For now, "it's a sprint to the midterms," Enten said. And after Election Day, "it will become a marathon to 2020."